Today's post is my August Favourites! I cannot believe that we are half way through September already and I've already moved back to Uni ready to embark on my fourth and final year studying Events Management. Time is going so fast and it needs to slow down! 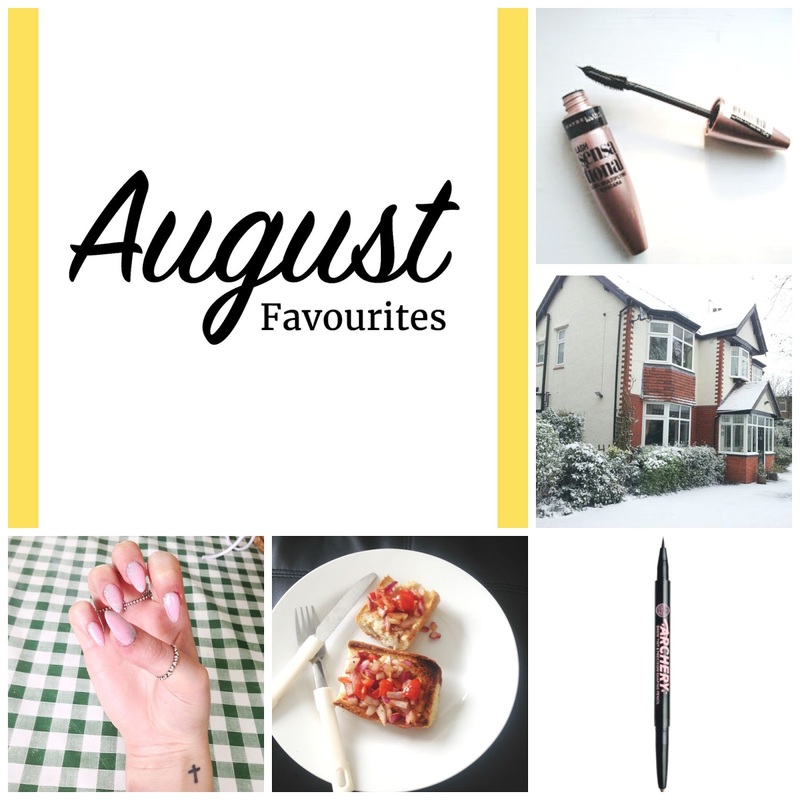 So as we're speeding through September, I thought it was about time I shared my August Favourites. I have been loving the Maybelline Lash Sensational Mascara. As you probably know it's my favourite mascara and has been for a while and although I've posted about this loads of times and have featured it in my favourites before, I couldn't not include it for this months as I've been using it none stop. You can read my full review of it HERE. I have really loved being able to spend some time at home during the month of August. I finished my placement year and then moved home for a month before heading back to Sheffield for my final year and I enjoyed spending time with my family and friends and simply just doing "nothing". I've been loving my brow archery pencil throughout August. When I was on holiday in Majorca I wore nothing but the brow archery in the days spent sat by the pool. It fills my eyebrows in perfectly but it also doesn't look too dark and "drawn on" either. I seriously recommend you try it! If you'd like me to do a full review on my blog then let me know in the comments down below! I LOVE BRUSHETTA. In Majorca I had this for nearly every starter! It's such a tasty snack and is kind of healthy too! I love making it myself and I use red onion and tomato and mix it with balsamic vinegar and olive oil. It tastes SO SO good. I will be featuring a quick Brushetta recipe on the blog hopefully very soon! I loved having my acrylic nails back during my summer holiday in August . I get them done back home in Liverpool and I love getting them done in a pointed shape. This time I decided to opt for a pale pink colour with silver sparkles and I LOVED it! I always love the way my nails look when they're long and pretty but acrylic nails do badly damage my real nails so I only get them done every once in a while! Well, that's my favourites from the month of August! What have you guys been loving? Let me know in the comments!